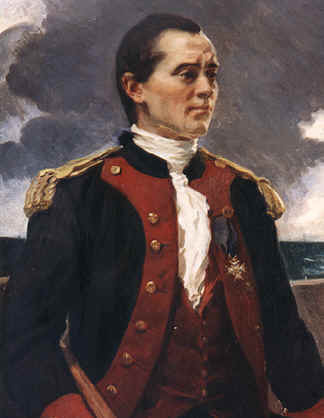 Famed naval officer John Paul Jones was born in Scotland in 1742. His career at sea began at age 13, and by 21, he was the captain of a ship sailing between the West Indies and British ports. 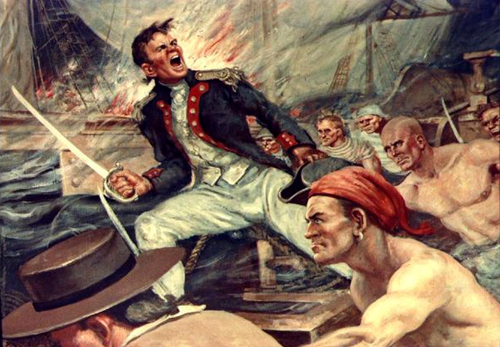 Jones joined the Continental Navy during the American Revolution, enjoying his greatest successes in international waters. As commander of the heavily armed vessel Bonhomme Richard, Jones famously announced that he had “not yet begun to fight” during a clash with the British warship Serapis. He later served in the Russian Navy and died in Paris in 1792. Jones was born in Scotland and was apprenticed in 1761 to a merchant. At thirteen years of age, he began his career at sea, as a ship’s boy on the Friendship sailing between Britain and Virginia and the West Indies. Over the next fourteen years, he learned the ways of the sea, sailing on merchant ships, including slavers. By age twenty-one, he was the captain of a merchantman sailing between the West Indies and British ports. On one of these voyages in 1769, he had the ship’s carpenter whipped; not long afterward the carpenter died, and Jones faced a charge of murder but was later freed. In 1773, he put down a mutiny, running his sword through the ringleader in the process, and fled to America to avoid trial in a civil court. Shortly after the Revolution began, he was in Philadelphia and through the friendship of Joseph Hewes, a delegate to the Continental Congress, was commissioned as the first lieutenant on the Alfred in the Continental Navy. Jones proved himself a capable officer in action on the Alfred and on the sloop Providence, which he commanded in 1776. The next year Congress sent him to France as captain of the Ranger with orders to attack enemy commerce in British waters. His greatest success on the Ranger came in April 1778 when he sailed from Brest for the Irish Sea and then to Whitehaven. This superb foray saw him fail in his attempt to abduct the Earl of Selkirk, whom he intended to exchange for Americans held by the British, but he captured the sloop of war Drake in a fierce struggle. By May 8, the Ranger was back at Brest with seven prizes and many prisoners, having created a furor in the British press. The French now took note of Jones and sent him off in August 1779 in command of a fleet of five naval vessels and two privateers. This voyage carried Jones and his ships clockwise around the British Isles. Jones’s ship was the Bonhomme Richard, around nine hundred tons and slow, but the most heavily armed vessel he had commanded. Prizes were taken, but an attempt to extort ransom from Leith, Edinburgh’s seaport, failed. The fleet sailed on until September 23, when Jones fought one of the great battles of the Revolution off the Yorkshire coast. The enemy was the Serapis, one of the British escorts of a large convoy. 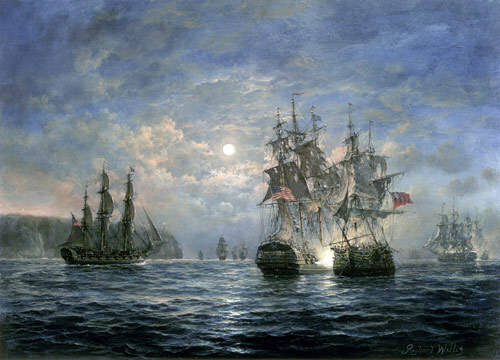 In the battle, mostly fought in the moonlight, the Bonhomme Richard grappled with the Serapis. 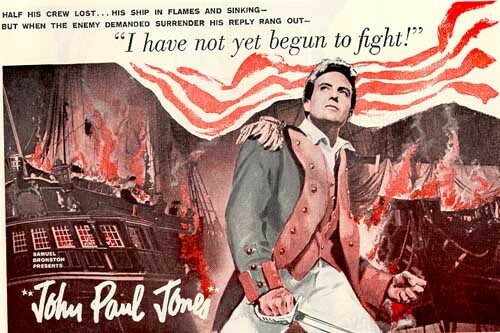 With the two vessels lashed together, the British captain asked Jones if he wished to surrender and received the famous reply, “I have not yet begun to fight.” Indeed, Jones had not, and when the night’s work was done, he accepted the surrender of his enemy. This victory was the high point of John Paul Jones’s war–and life. After the war, he served in the Russian navy in the Black Sea in a war with the Turks. He died in Paris, still an American citizen and one of the great heroes of the U.S. Navy.